Everybody is praising the benefits of mentoring. The mentees get a lot of guidance and the mentors become better educators and leaders. Big corporations have established structured mentoring programs. Entrepreneurs also advocate the importance of these relationships.Yet, we hear many stories where mentoring went really bad. 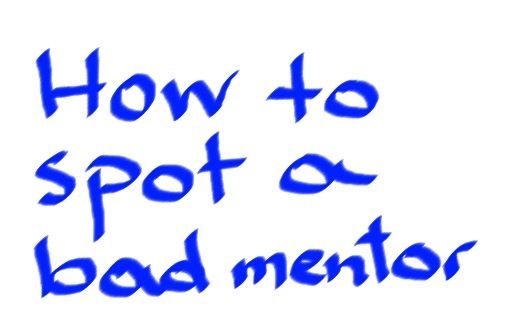 So the question is: Can you spot a bad mentor? Incompetent – This is a no-brainer. However, sometimes they camouflage themselves as knowledgeable and approachable. Be aware! A good mentor will offer good advice. They will have an understanding of practical issues and how to get round them. This is important for both entrepreneurs and corporate people. In order to get a good mentoring relationship, invest time to find the right person. Talk to people you respect. If there is chemistry, ask them if it is ok to get their thoughts on a couple of issues. Start slow. Assess the advice they give you. If the relationship progresses well and there is interest from both parties, you may want to give it a bit of structure; e.g. catch-up every once every three months. It is also important to think what you really want to get out of the relationship. Do you expect your mentor to be your advocate for your next exciting project or promotion? Or do you want someone who can act as a sounding board and give you big picture guidance? I am a big fan of the latter. I had two great mentors while I was working at Eli Lilly. They were more senior than me and they worked at very different regions. Hence, they were able to advise me on what experiences I need to get under my belt, how to best position myself and how to navigate the corporate culture. These relationships were based on trust and respect. They became stronger and even more useful to me when I left the company. If you are more interested in finding a sponsor within the company, be aware of the corporate politics that go with it. You may get the support of your chosen mentor but not of his internal competitors. your direct supervisor (or his/her manager) cannot be your mentor due to potential conflict of interest. If your mentor becomes your manager, then you need to put an end to the mentoring relationship. you may get more than one mentors. It will be useful to get the perspective of someone who doesn’t work in the same company. Also, if you plan to change careers or set up you own on business, get a mentor in the new path you plan to pursue. don’t pay for mentorship. If you do, consider it consulting – not mentorship. The bottom line: Mentoring relationships can be very beneficial as long as you find the right person. You know now how to spot the bad ones. Did you have any bad mentor experiences? What happened? It will be great if you can share your learnings. This entry was posted in b4iapply for a job, Career Advice and tagged bad mentors, how to get a mentor, tips for mentoring, when mentoring goes bad. Bookmark the permalink. Korina, what you write is very true! I would add something that one of my best mentors said to me: this relationship is a two way street; you learn from me, and I learn from you. . I totally agree with ‘You learn from me and I learn from you’ concept. Absolutely spot on. I would add a couple of things …….avoid the ‘insecure’ mentor – the one that is not so comfortable with himself or herself that they are always going on about themselves vs what they have learned! And one of the best things I learned from a great mentor was – always , always respond to a communication……if a person takes time to write to you or call you then you owe a response, whether it be ‘ I will get back to you shortly’. Yes to avoid the ‘insecure’ mentor. Also great advice about ALWAYS respond to a communication. We are so busy sometimes…but a quick email or text is a must. It will also help to find out whether the request is about an urgent matter or it can be dealt a few days later. My new boss has stated from day one that he is going to mentor me (do I have a choice?). The problem, other than what you mention above, is that I have absolutely no respect for the guy (he is a bit letchy to boot which I bristled at, ie there are very slight sexual politics). Now I have to listen to his rather insulting advice regarding my personality and divulge/debate my personal life and career goals with him on a regular basis. I really want to seek out my old bosses (in the same organization) for mentorship, but my creepy new boss has already claimed me so now I would have to be somewhat secretive about seeking mentors who I actually respect and want. Any thoughts on overly eager people who seek out mentees? Any advice on how to shake a mentor who has imposed themselves on you? Sophie, I understand that you are in a tricky situation. It sounds that the main problem is that you don’t respect your new boss. A bad relationship with the immediate manager is the #1 reason why people leave a company. My advice would be to find one or two areas your manager is good at and try to learn from him. In this way, your every day interaction will be more manageable and may even improve. You can always have informal discussions with your previous bosses – I wouldn’t label it as ‘mentoring’ though to avoid putting more strain in an already difficult situation. Also, you mentioned sexual politics. Not clear what you mean by it. If you imply sexual or any other form of harassment, please talk to your HR. Don’t take advice from creepy mentors. But MORE importantly FIND the mentor you want advice from , and put the responsibility on yourself to GET those mentors. What if a Mentor wants his Job done and says that you have to listen, if you want to get rich you must listen to what I say.